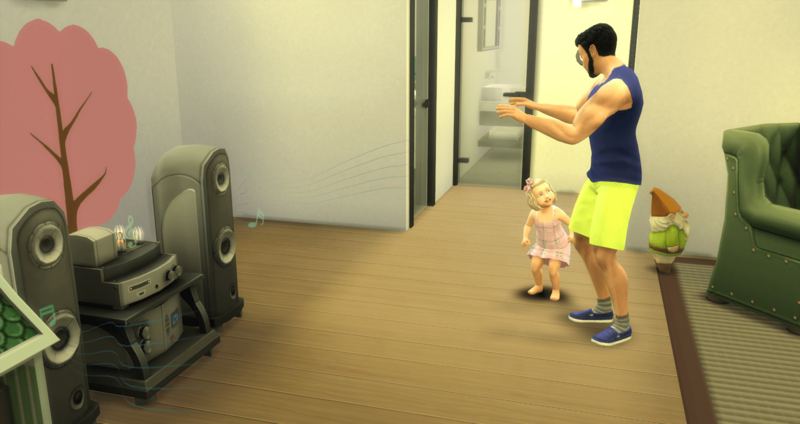 Merry flips herself out of the bassinet and into Castor’s waiting arms. 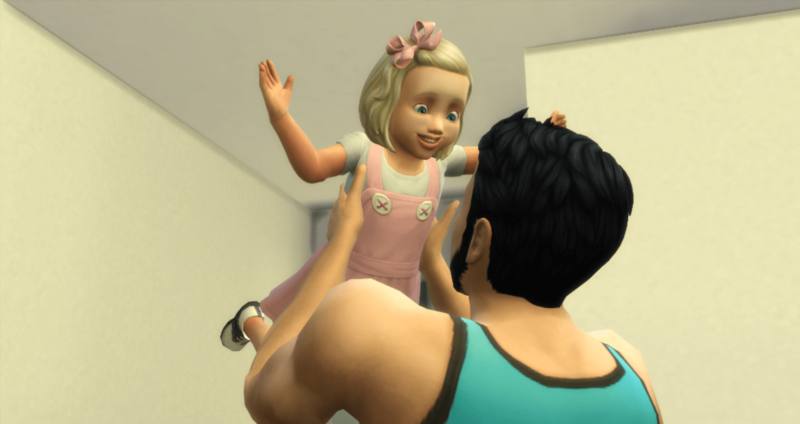 He catches her, helps her with the basics of standing and walking, and the challenge begins. 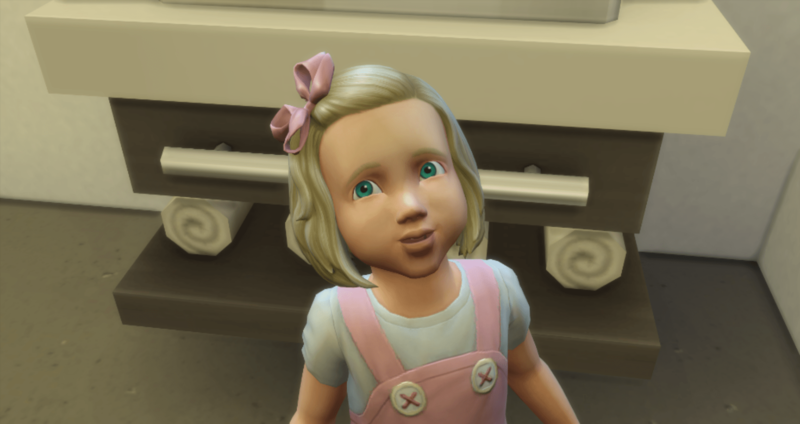 I am excited – while I haven’t seen the rest of her outfits, at least this one matches her hair bow. 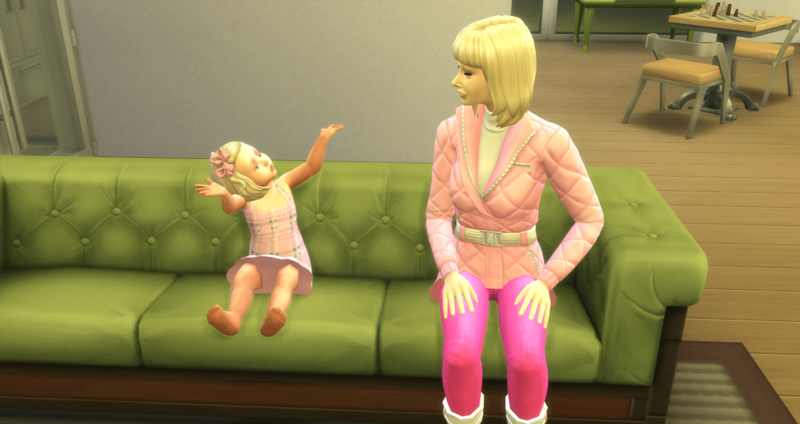 Portia will plan her outfits later while she is eating, but for now we can enjoy pretty in pink, silly Merry Grace. 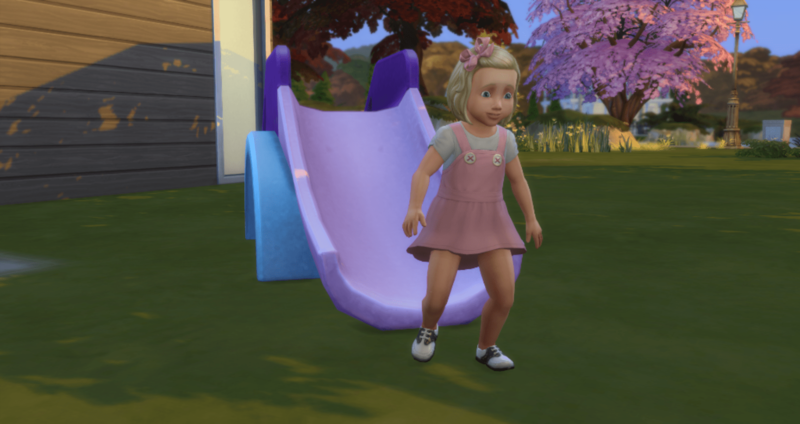 Merry grew up with the silly toddler trait. 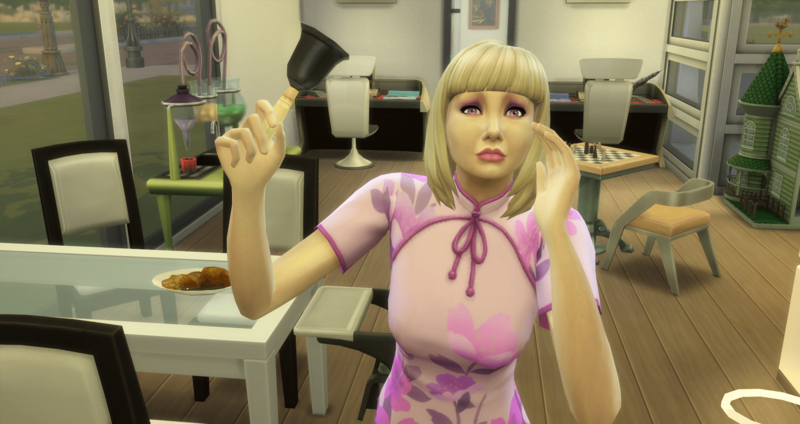 I am playing with the mod, Random Traits & Aspirations by graycurse, so I do not get to choose any of her personality traits. They will be randomly assigned each time she ages up which will give the challenge an added flavor. I love this mod. The challenge begins today with Merry learning to use the potty. I was expecting Merry to object to learning to use the potty because of her first expression but she agreed, so no defiance yet. 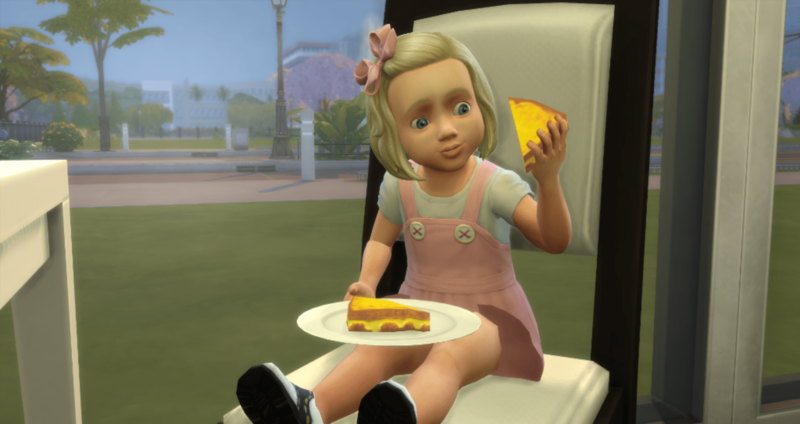 Merry needs a break during her potty training for some food as she aged up hungry. 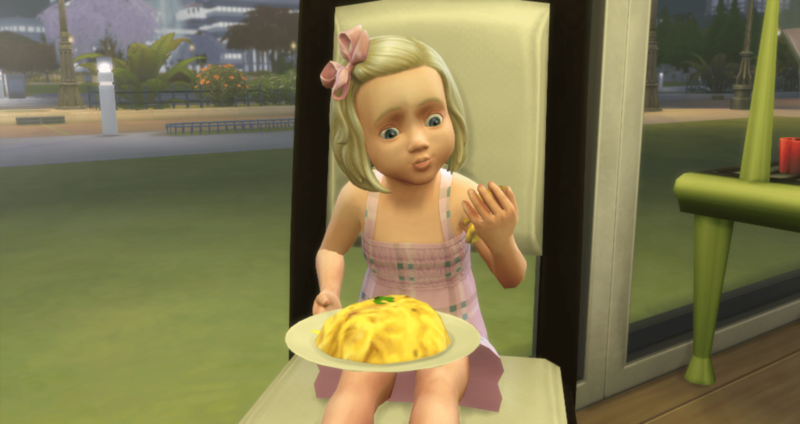 I generally try to make sure my babies grow up having just been fed, but Merry was an easy baby and rarely cried and I didn’t know she was hungry. 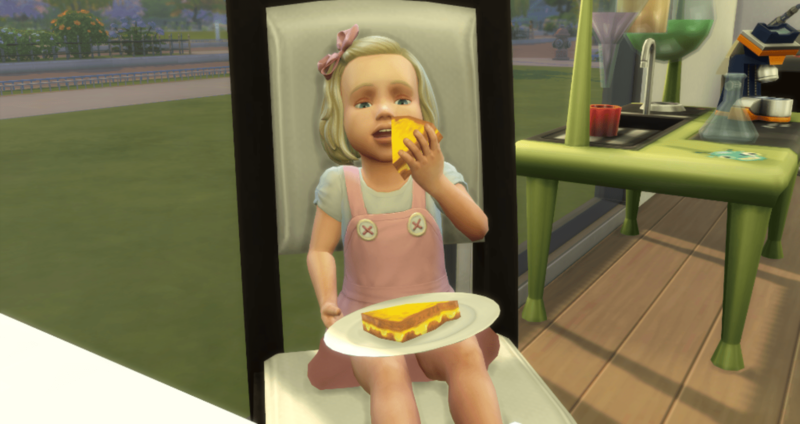 Her first big girl meal is a grilled cheese sandwich. She thinks she likes it. Merry’s fun needs some boosting so Castor gives her some play time before bed time because revving up a toddler before putting them to bed is always the right choice – and it seems to be the choice dads always seem to make. 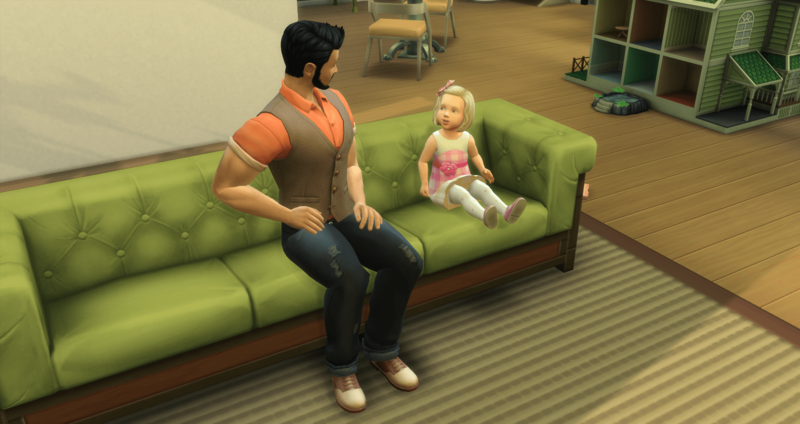 The good thing is Merry does get her potty skill to level 2 before Castor put her to bed with a story. Portia is not impressed with Castor’s activity choice either. The number of times I had to remind my husband that roughhousing before bedtime would not tire the children out and help them sleep better. 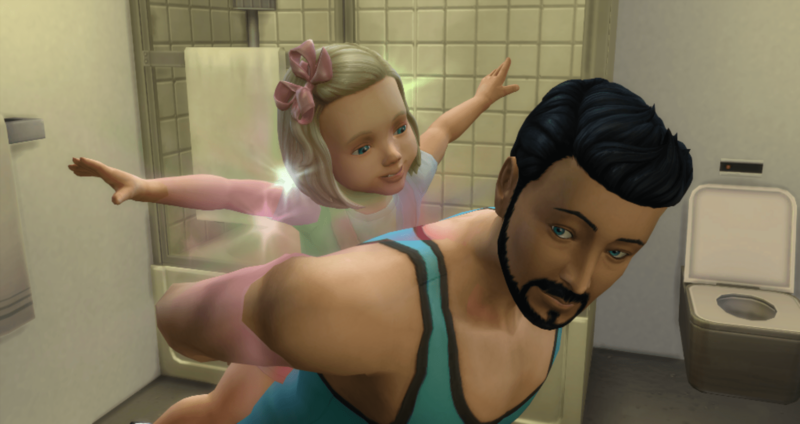 Portia has been working on finishing bodybuilder but she needed her own potty break. Just before I took the picture she was frowning at them. 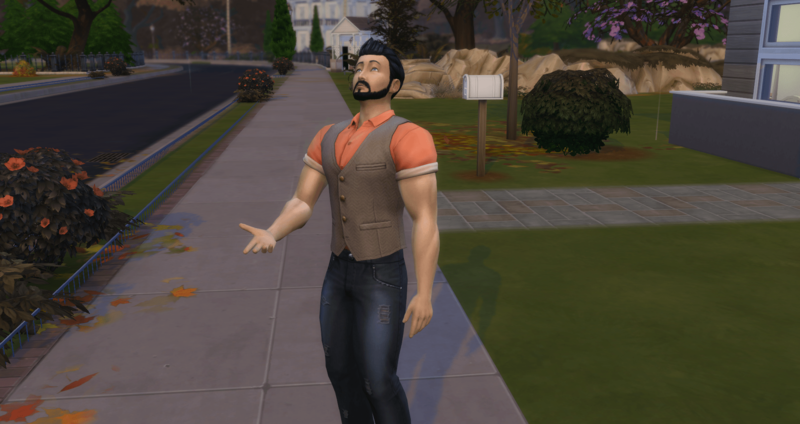 While Castor was getting Merry ready for bed, Portia went out and finally completed Bodybuilder. She switches her aspiration back to Super Parent and will take over taking care of Merry so that Castor can focus on the household maintenance and working on his career skills. He has to level both programming and video gaming for tech guru. 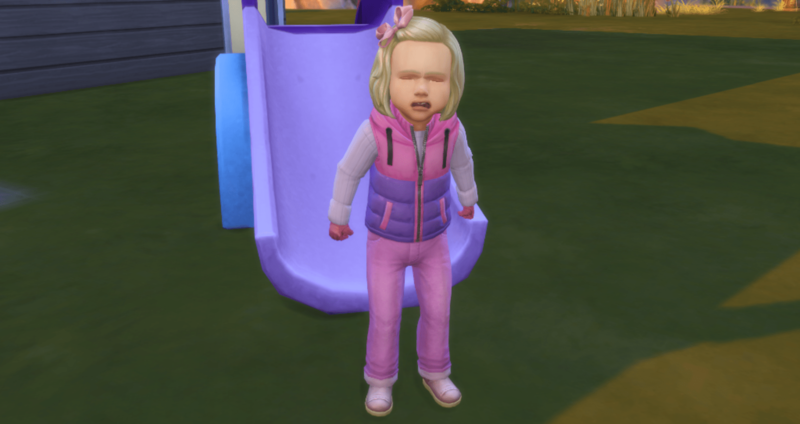 This is why you don’t let toddlers dress themselves. Portia and/or Castor will be planning Merry’s outfits going forward. So much for being impressed that her daily outfit matched her bow. Apparently that was a fluke. 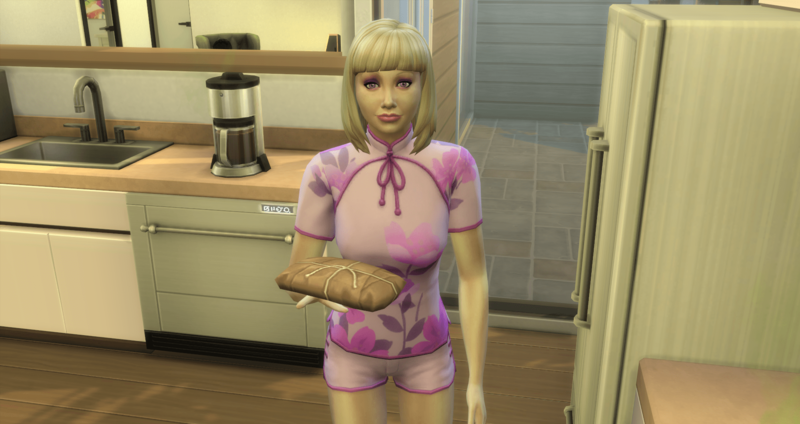 When she changed into her night clothes, I just about died laughing. This looks exactly like something my daughter would have tried to wear. That is much better, although Merry isn’t happy that she had to change clothes. And there is so much pink now. Maybe too much pink, but it matches her name. 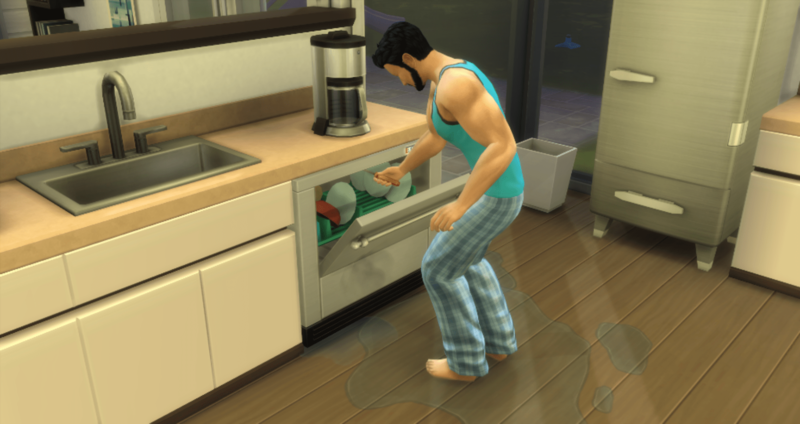 With Merry down for the night, Castor cleans up a few things and repairs the dishwasher, which has been broken and spewing water all day. Then he heads to bed. Once the potty is mastered (finally), it is time to learn to communicate. But first, it is time to put some food into her belly while Portia cleans up the mess Merry left in the bathroom. 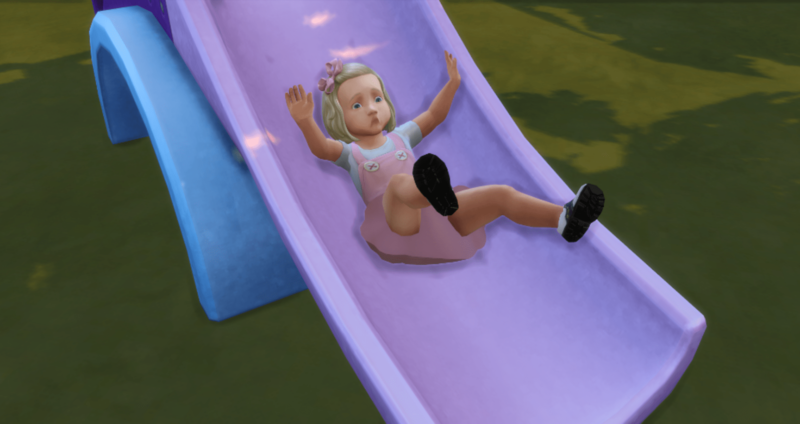 Merry tends to be happy most of the time so even being sad about making a mistake with the potty isn’t her primary emotion. The sadness is buried behind happy moodlets. 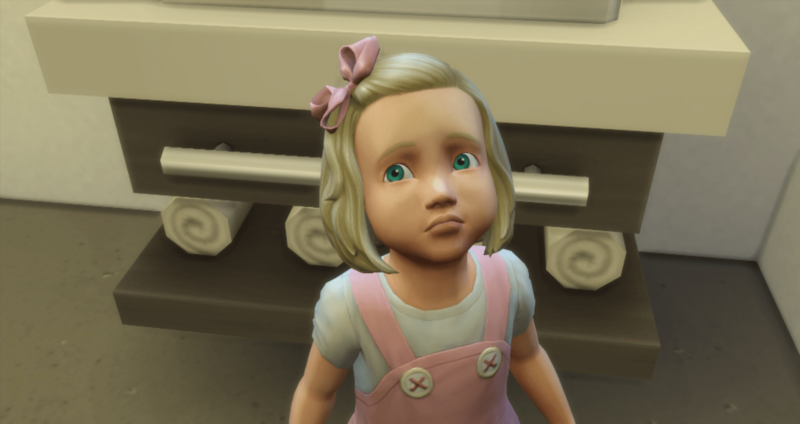 Portia needs to scold Merry five times for her aspiration so when she finally queues up a tantrum, she gets to have her tantrum. 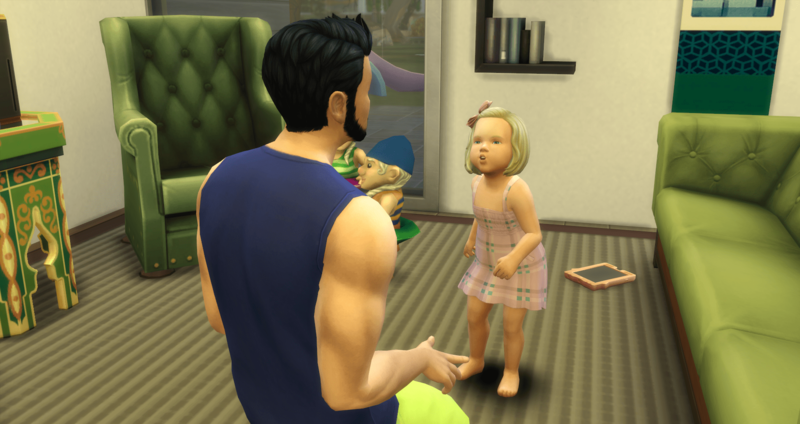 Portia scolds her and then puts her to bed with a story. The teddy bear, or in this case, the unicorn, is a fast way to max communication – really fast. 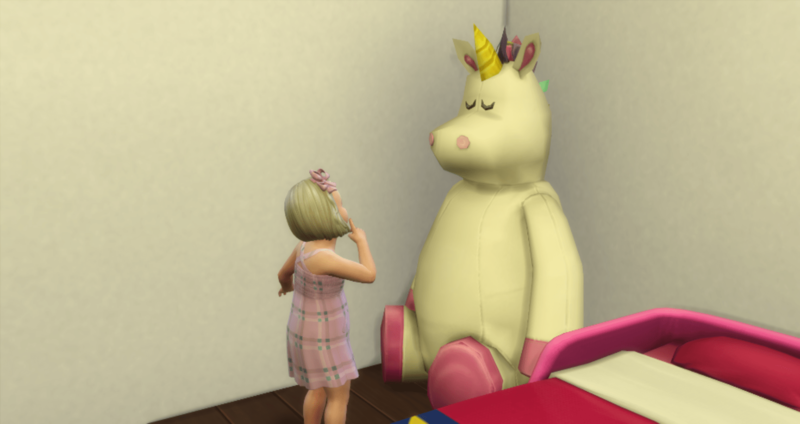 Communication with the bear/unicorn is probably the fastest skill to level in the game – it took Merry three in-game hours to max out the skill by babbling to level 2 and then hugging to level 5. This was leveled so quickly that there really wasn’t much to say about it. With communication mastered, Merry moves on to movement. 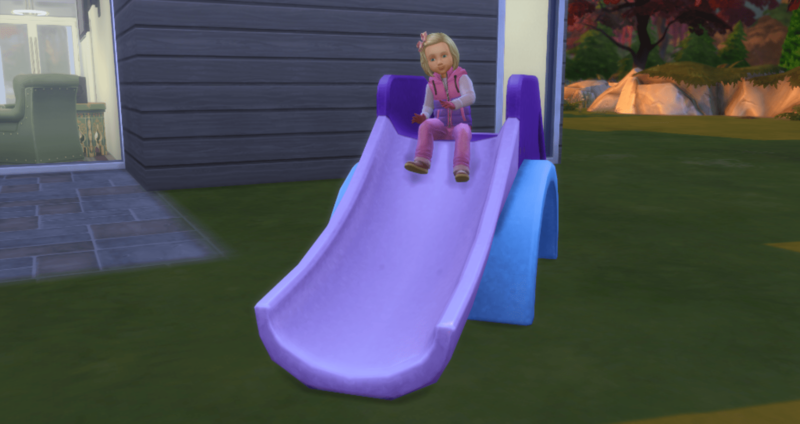 The slide will allow Merry to quickly master movement and soon she will be running circles around the house. But not today. 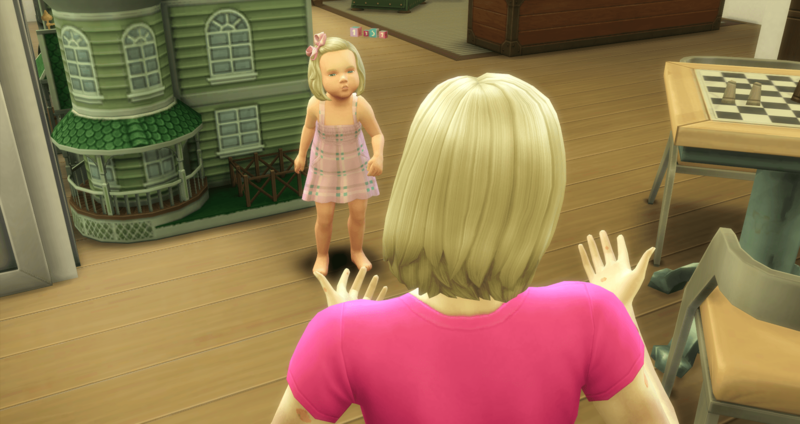 Merry must be getting tired because she has another tantrum, which gives Portia another opportunity for a scolding. Portia then puts Merry to bed with a bedtime story. Finally, Merry is on a “normal” sleeping schedule – going to bed in the evening (about 7 PM this time) so maybe she will sleep through the night and be up during the day. 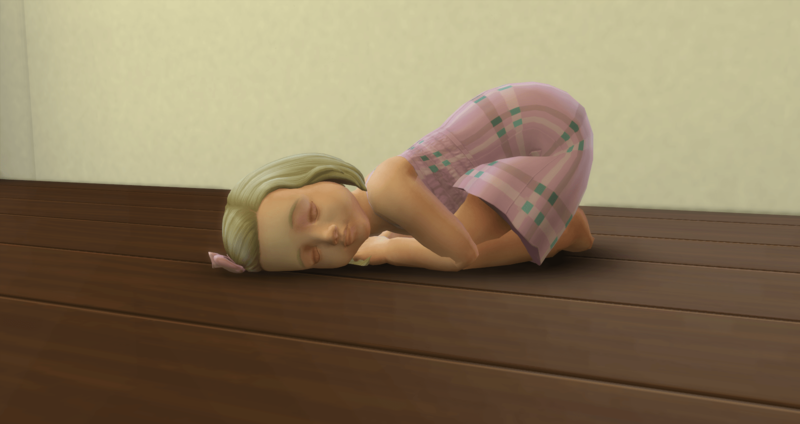 She has been on a sleep during the day and up at night schedule since she became a toddler. Although she went to bed hungry, so she will probably wake up in the middle of the night starving. For once, even the adults went to bed before 11 PM. 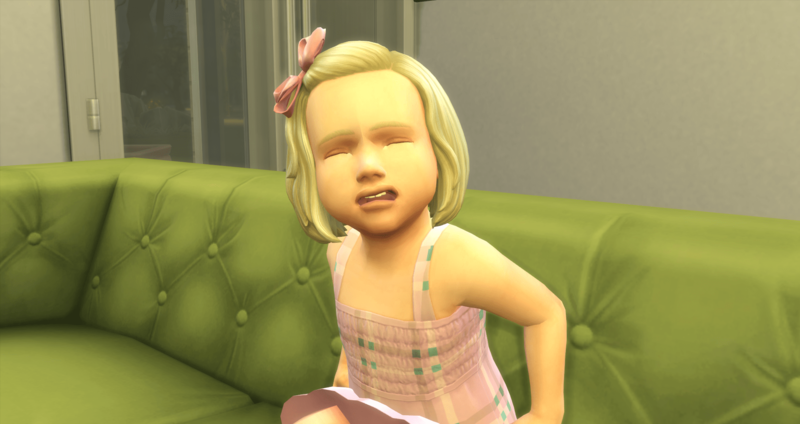 So close – 3:15 AM – she wakes up starving and needing to potty. Once she takes care of business, she goes back to bed for a little while. She can get up when it is light outside. But at the end of the day (or at 2 PM) you max the movement skill and it is time for a potty break, a snack, and a nap. Ahh, made it. The sweet tinkle of relief. And you still have a clean diaper. Although her hygiene is starting to drop, it isn’t from using the diaper. Imagination is the next skill that needs to be mastered. 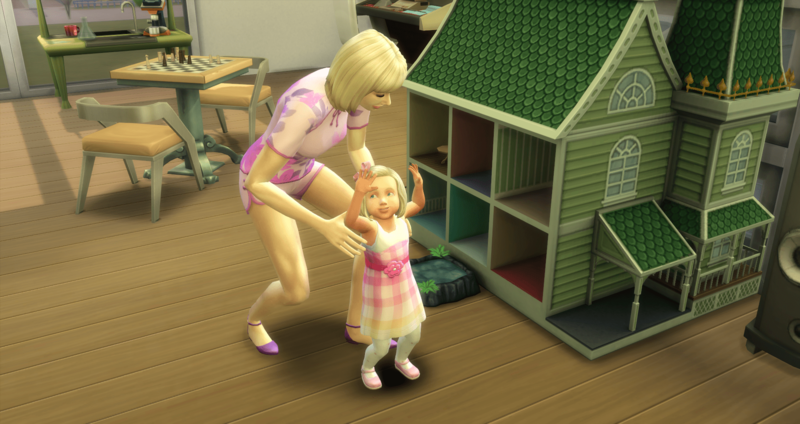 This will be done through a combination of Portia reading books to Merry and playing with the dolls in the dollhouse. Or they might watch TV while Merry eats lunch. Merry gets a bath before her nap, although I am not sure it is still called a nap when you go to sleep after 5 PM. But all of her needs are in the green so maybe she will sleep through the night. She is still five days from her birthday and only has imagination and thinking left to master. 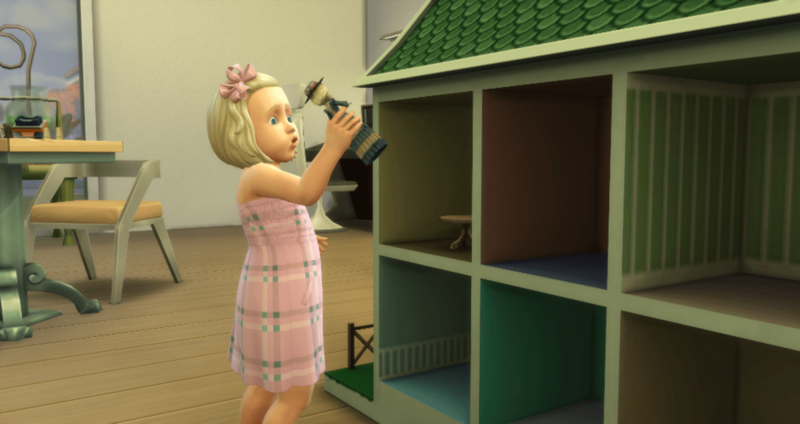 Portia takes the day off from work to stay with Merry and their plans for the day are reading books and playing dolls with the dollhouse. 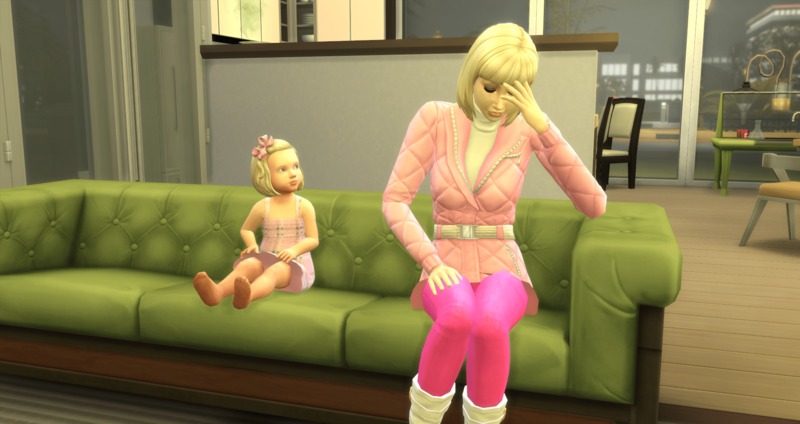 Merry defies Portia and then watches to see what her reaction will be. 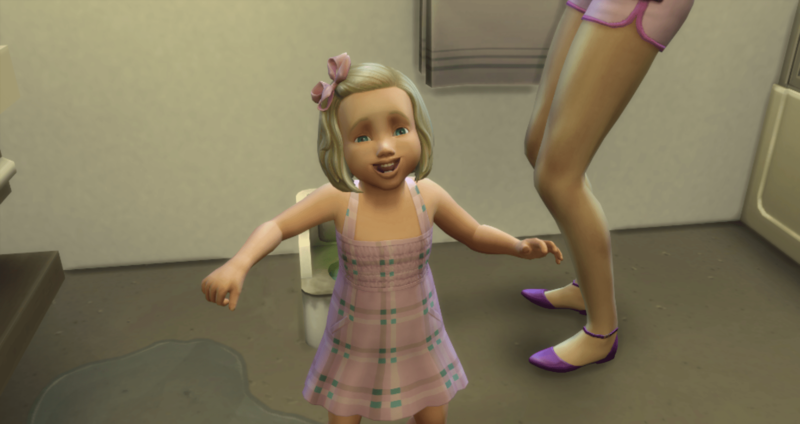 Silly children always seem to have happy faces. It can be difficult to get truly defiant expressions unless their needs are tanked. Meanwhile, Castor has been relegated to cleaning the poopy potty chair before he is allowed to go to bed. 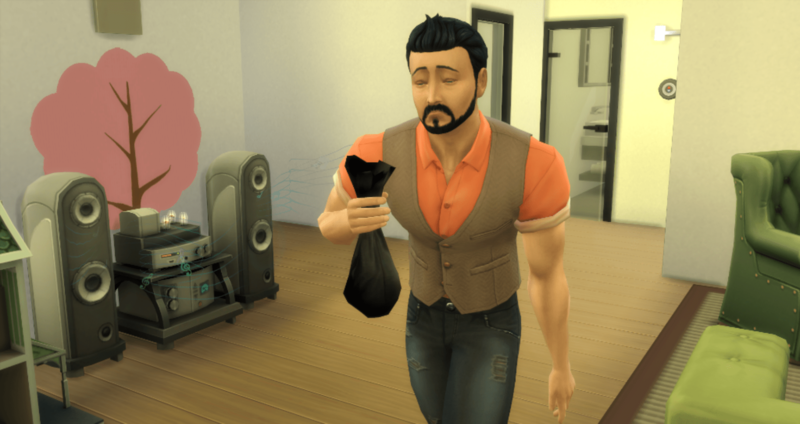 As long as he doesn’t drop the bag of poop. He should probably open his eyes. I am still trying to figure out the fastest way to level imagination. Nothing really seems to level it quickly like movement and communication can be leveled – or at least I haven’t found the secret. 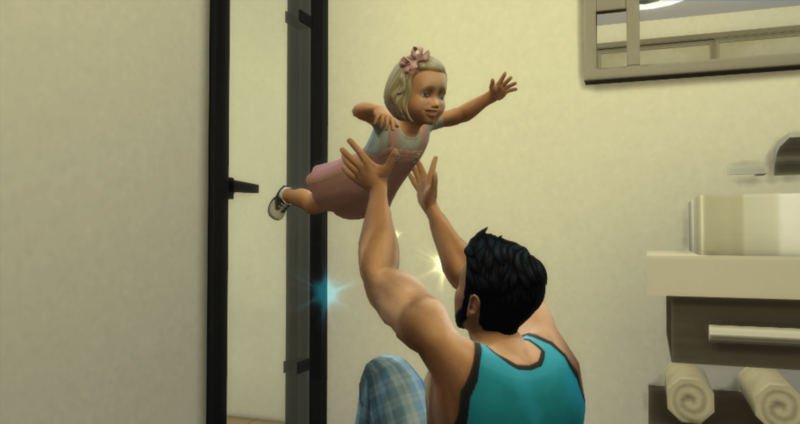 Take that adult, I defy thee! 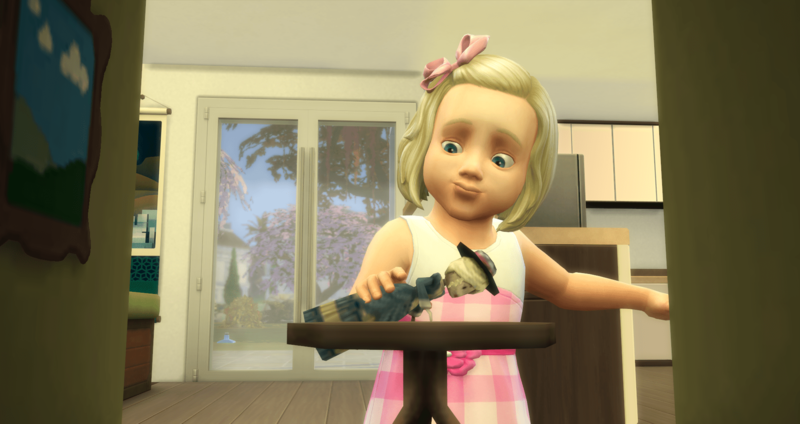 Today is Harvestfest and Portia takes on the task of making a Grand Feast. Of course, she sets the dinner on fire. 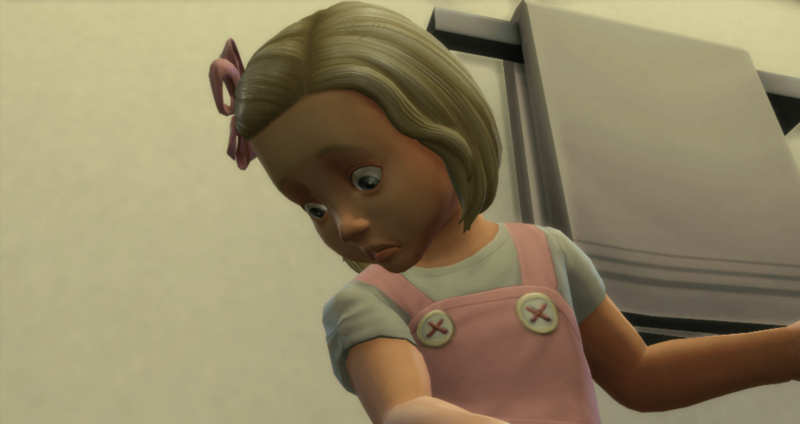 Which glitches the stove, and it glitches Portia. So, I replace the stove and the fridge (got to have a matched set after all) and she tries again. 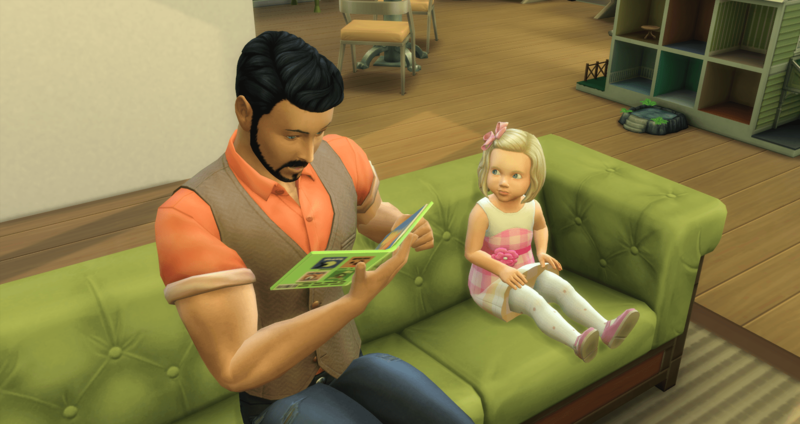 While Portia is working in the kitchen, Castor takes over reading with Merry. She is still working on maxing out imagination. She is getting close, and just needs just a little bit to finish up. 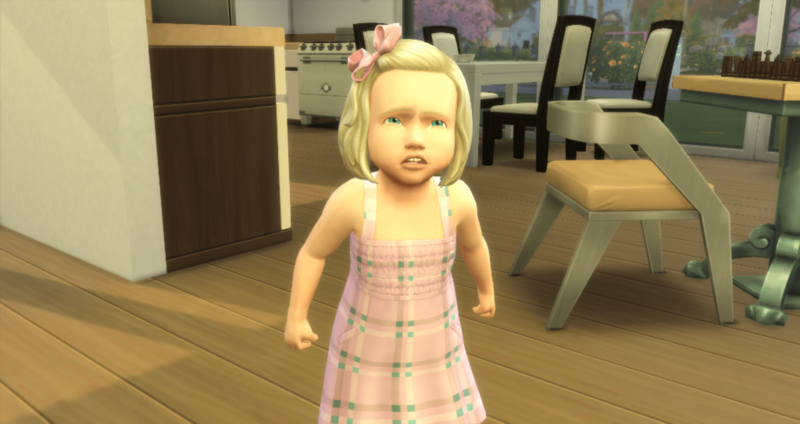 But before she can get it maxed out, she needs a break from books because they are making her cranky. Castor tries to brighten her day to give her a break. She likes that. Then he asks if she wants to work on flash cards for awhile. She doesn’t like that. Silly children don’t give ugly defiance. They give cute defiance and then they look at you with sweet faces to see if you are mad. Then they either get upset or mad that you got mad or upset. The feast is ready! Come and get it while it is hot! Everyone enjoys eating at the same time for a change. They talk, they laugh, they tell jokes. 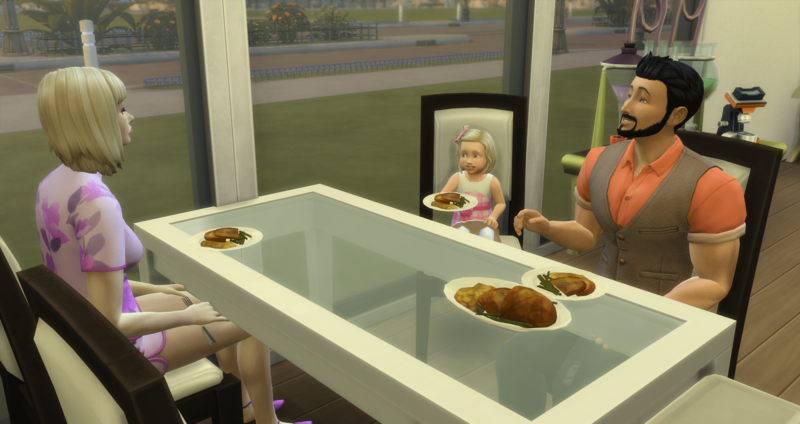 After they enjoy the meal and complete the traditions for the Harvestfest, Portia returns to her painting, Castor to his programming, and Merry to her dolls where she finally maxes out her imagination skill. Finally, we get to the thinking skill. 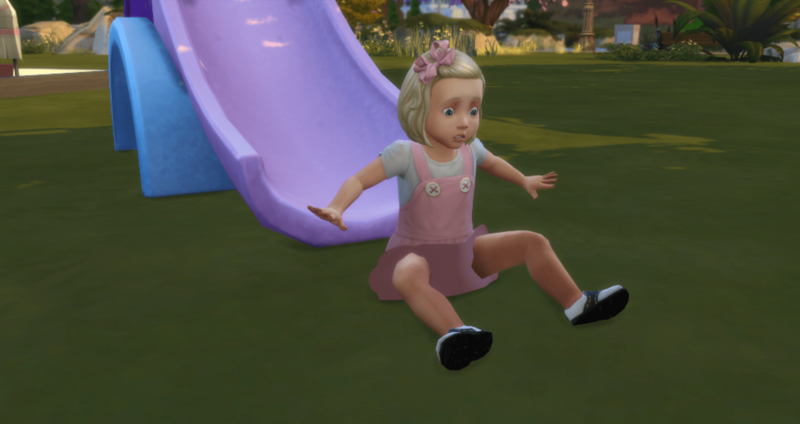 This is always the hardest for my toddlers to master. It takes a combination of the flashcards and the blocks to get them to level 4. At level 4, they can then ask why, which will master skill, while irritating the crap out of their parents. This is also true in real life also – the fact that constantly asking why irritates the crap out of parents because now we have to think of reasons that actually make sense. Merry has had quite enough for one day and is heading for bed (3 PM). She is calling it a day but she will be up very early to start again tomorrow, I am sure. Very early indeed. This is high quality coffee! Where have you been all of my life? Everyone needs someone or something that they can look at the way Portia is looking at her coffee. It is like she has just discovered the secret of the universe. (Everyone knows that it is 42). 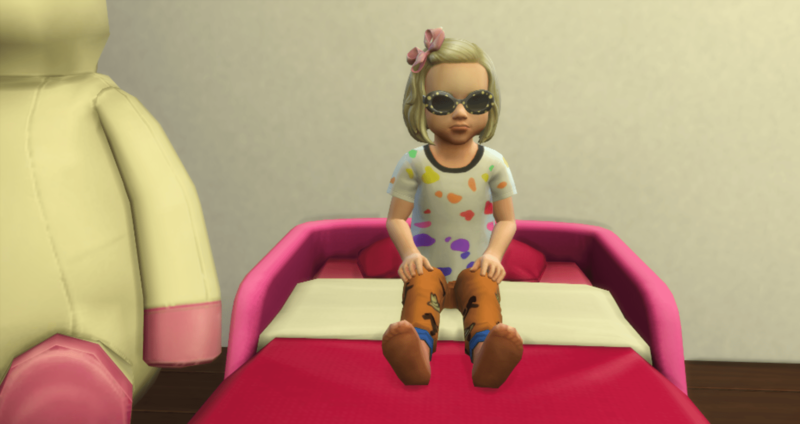 Merry wakes up around midnight (either she got up early, or that was just a nap) and spends time with the blocks and then with her tablet, still working through level 2 thinking, finally reaching level 3 in the wee early morning hours. She has just reached level 3 when Castor gets up and asks her if she is ready for a bath and to go back to bed for awhile. She agrees without any argument. Look who is squeaky clean and feeling fresh! Portia has poopy potty patrol today. Look at the muscle definition in her thighs. The gnomes are still hanging around from Harvestfest I see. It is so hard to teach anyone to think, much harder to teach a toddler to think – and it is boring. Merry is fed up with flash cards and she doesn’t want to play with blocks either because it isn’t fun when you have to learn. And she finally gave me an actual defiant face. 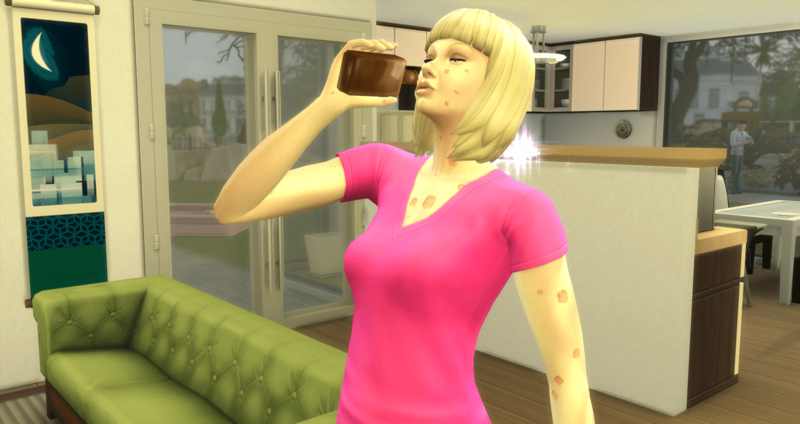 Portia has a weird rash looking something so she orders some medicine to take to get rid of it. She has to keep going just a little while longer. Merry is waiting on dinner and checks out the chess table. 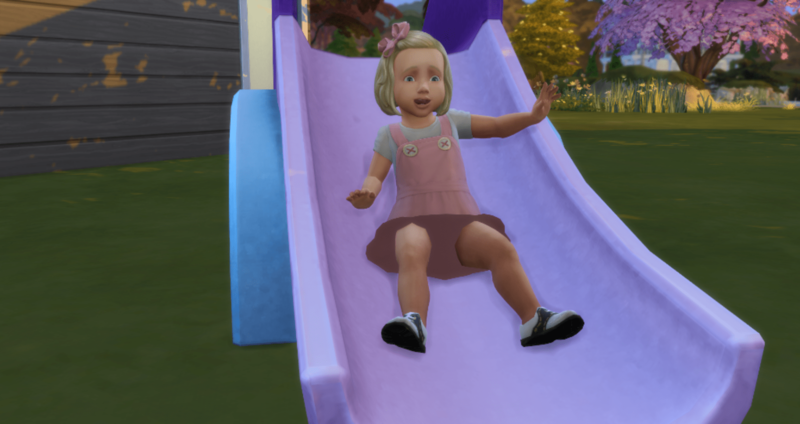 She can’t figure out how to play the game – yet. 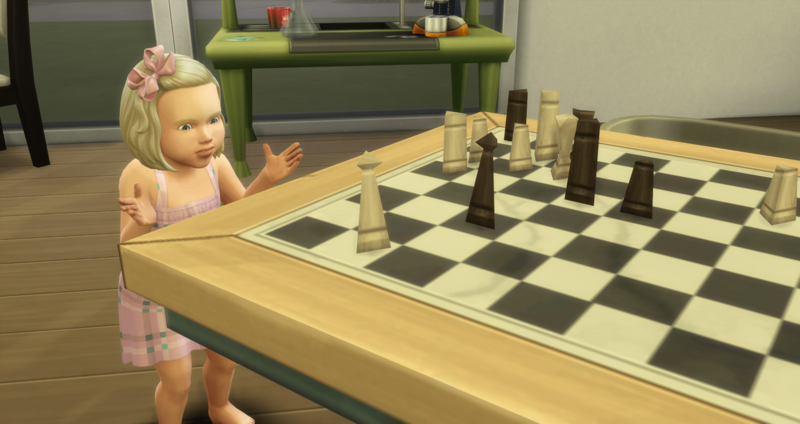 Soon she will know exactly how to play chess. 😉 While she was waiting for something to eat, I had her going around doing What’s That? and this just seemed to fit so perfectly. And the “why” has begun. Merry has reached level 4 thinking. Merry asked “Why?” about twenty-five times and (not soon enough) maxed out thinking. Portia doesn’t know WHY, just stop asking! 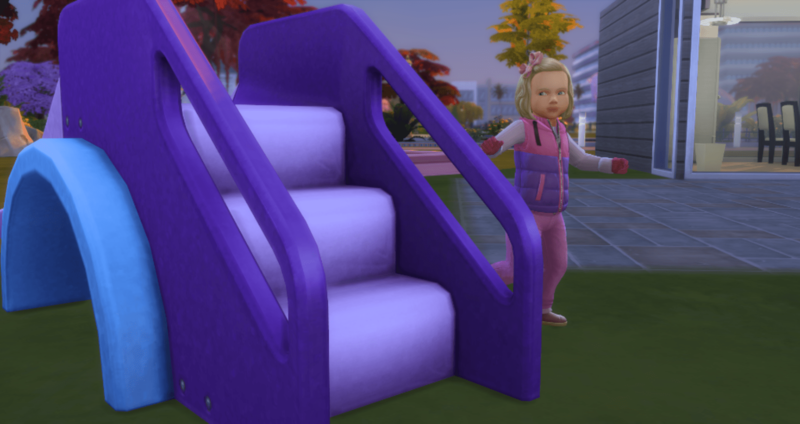 The last push to max thinking pushed Merry beyond her energy limit and she got very angry causing her to yell at Portia and have a tantrum. 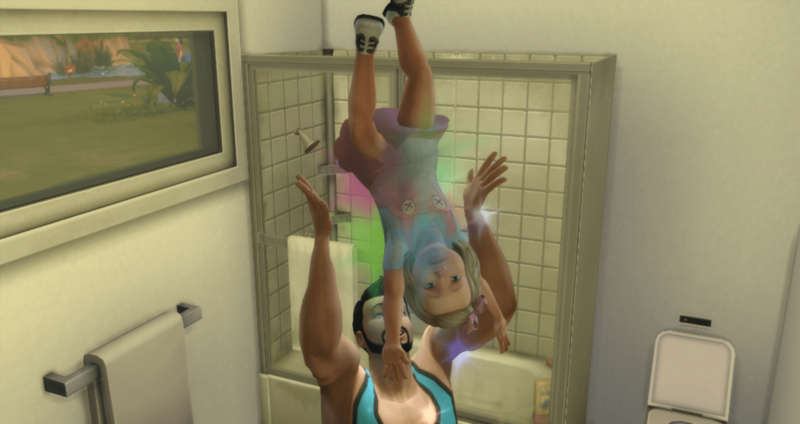 This allowed Portia to scold her the last two times she needed for her aspiration tier, so we let it happen, of course. It was a productive exchange for both of them. The downside is that Merry passed out on the way to bed. Thankfully, this doesn’t count against us in the challenge. Although I forgot to check Merry’s bladder status before putting her to bed and that would have cost us points. But I caught it in time and Merry was able to get to the potty and back to bed without losing any points. 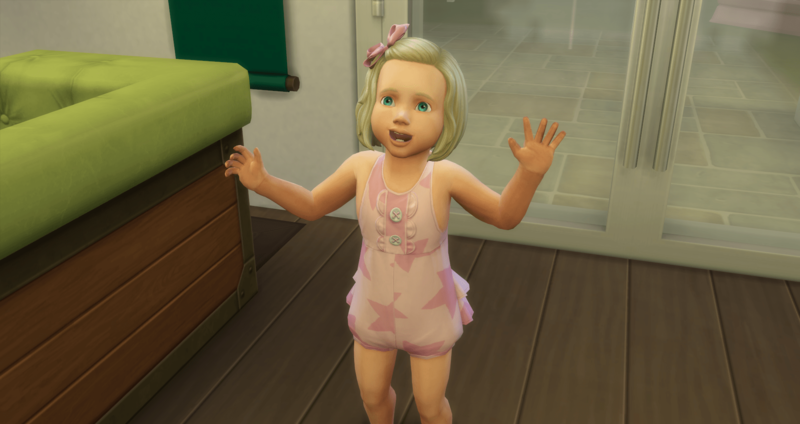 With all of her skills mastered, she is set to earn the Top-Notch Toddler trait, so I check to see if there is any reason to attempt to teach her manners or conflict resolution as a toddler. 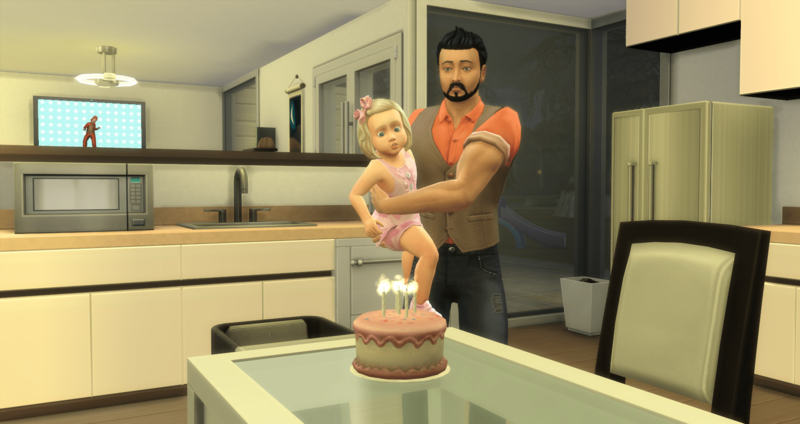 I have never noticed that it does anything good as a toddler – the needle doesn’t move much, if at all, until they are children – but I wanted to check just to be sure since Merry’s birthday isn’t until tomorrow. Thankless! Merry does not want to say please or thank you. No. No way. No how. You can’t make her. She is more receptive to learning to say she is sorry. This is apparently something that she is going to need to know. Apologizing Know-How! Happy to know that when the time comes, apologizing can help resolve conflicts. However, I can’t tell that either of her values moved enough to make the time spent worth the time spent. So, I think it will be better to move on to the next activity. Which means it is time to have a birthday party. I never have good luck with these, but what the hell, let’s see what happens. 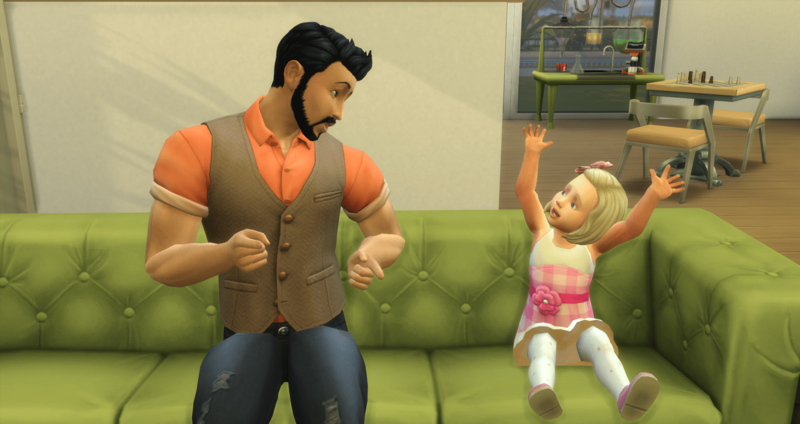 While they wait for Portia to get home from work, Castor and Merry spend their time dancing and telling stories and jokes. Have an Adult make a Toast – nope, couldn’t get the option to come up. The party ended with a Silver medal because I couldn’t get the toast option to come up for them no matter that I tried. Oh well, still better than I expected. Merry is a card-carrying member of the Clean Diaper Club, never once using her diaper. 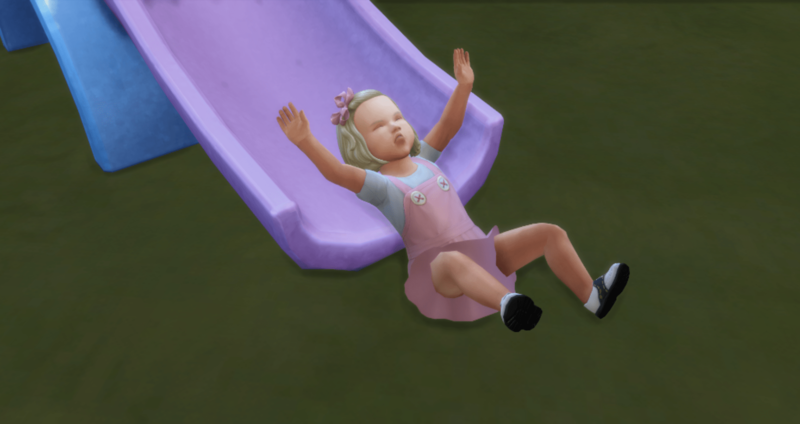 Her hygiene dropped to the point of needing a bath (twice) but she never had the option for someone to change her diaper. 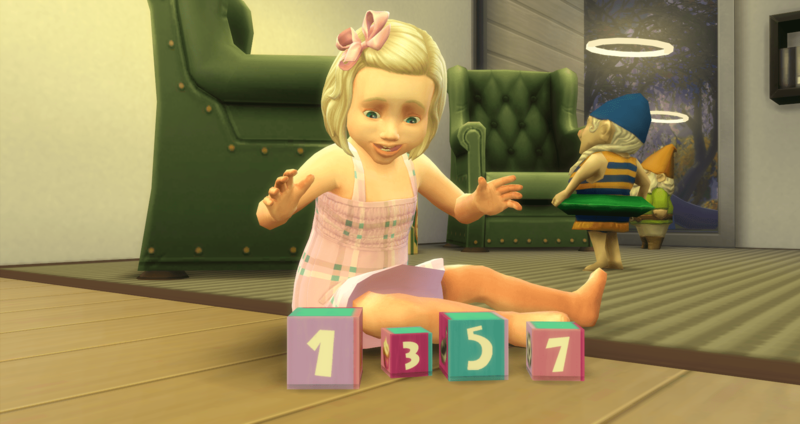 Merry earned a total of 30 points as a toddler. 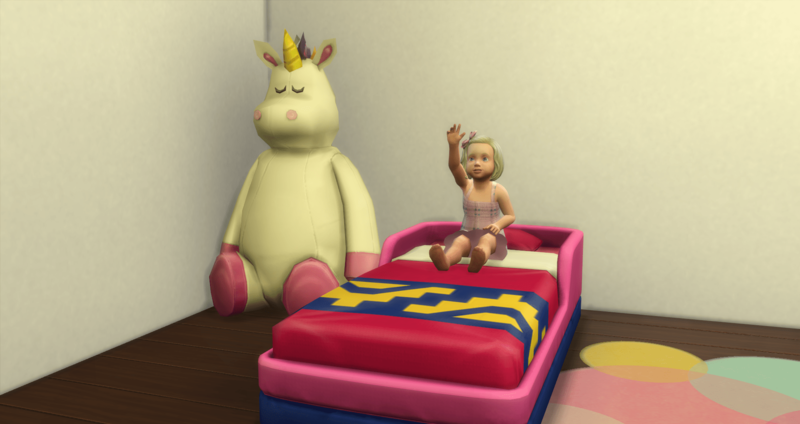 She maxed all of the skills (28 points) and did not use her diaper (2 points). She did not have a gold medal birthday party. 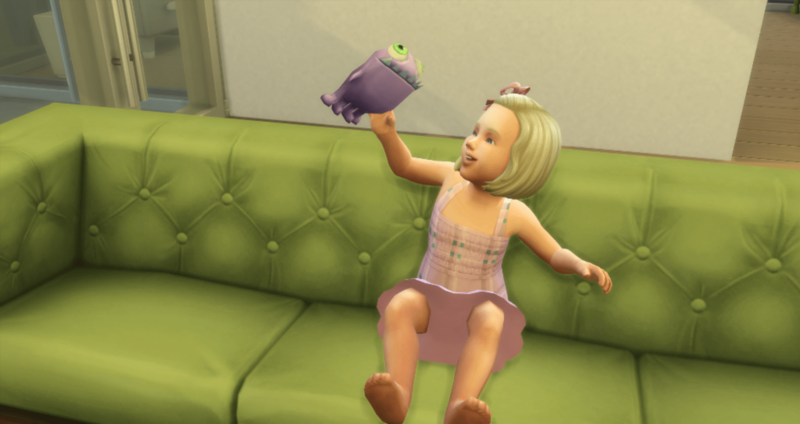 She doesn’t get the Toddler Bonus trait until she becomes a child so she will get those points after she ages up. I am only counting the points as she actually earns them. 😉 Technicality, I know.